What happens when you find yourself out of your depth and in thin air at the same time? 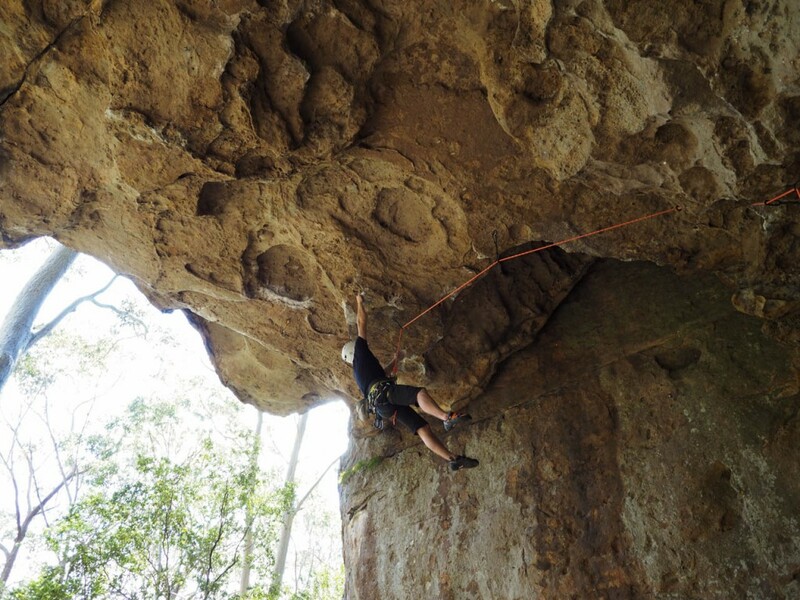 My friend and climbing partner Garry Lomas confronts his limits at Thompson’s Point, Nowra. 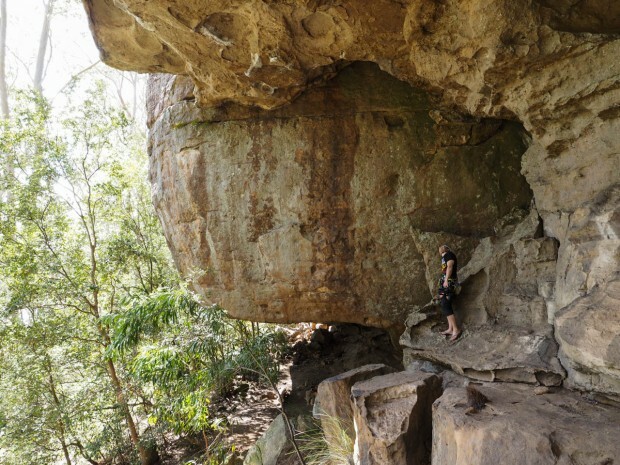 We were onto our fourth climb of the day at one of Australia’s best sports climbing crags and Garry was scoping out a grade 20 (5.10d) climb that I had mentioned to him in this area. He consulted the guide book. I sat quietly, a few metres back, recomposing myself after a shaky start on the so-called warm-up climbs. 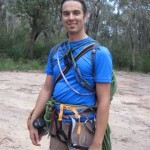 For a variety of life reasons and personal choices, it had been about 10 months since our last outdoor trip and we were both a bit short on the exposure and unusual moves that only outdoor climbing can bring. 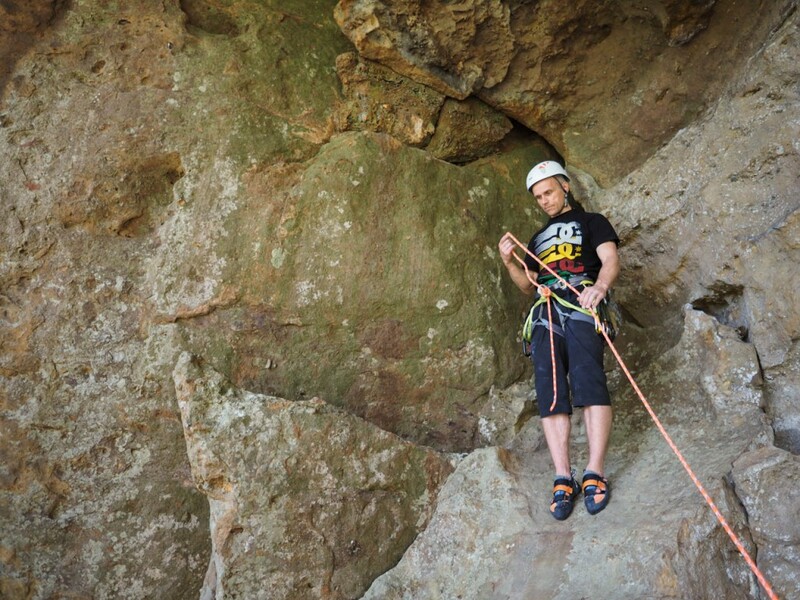 In theory the route was well within us, especially Garry who favours the more muscular style of climbing presented by these super-steep routes; we both climb about grade 22/23 (5.11b/c) in the gym, placing us firmly, if not permanently, in the intermediate band. I had to admit, it was a damn impressive and dramatic overhang but I wasn’t going near the thing. ‘What do ya’ reckon?’ he asked. After a while, he collected a dozen quickdraws and put his helmet on for a lead attempt. I hauled the rope up to the base of the climb. Looking back at the photos later, I could see the doubt etched across his face as he tied in. The climb itself started off fairly easy and before too long, Garry was heel-hooking and reaching his way across the roof. After a couple of rests, he stopped just shy of the clip he had pointed out earlier. The position looked horrible: a reachy move out to a big, slopey undercling. 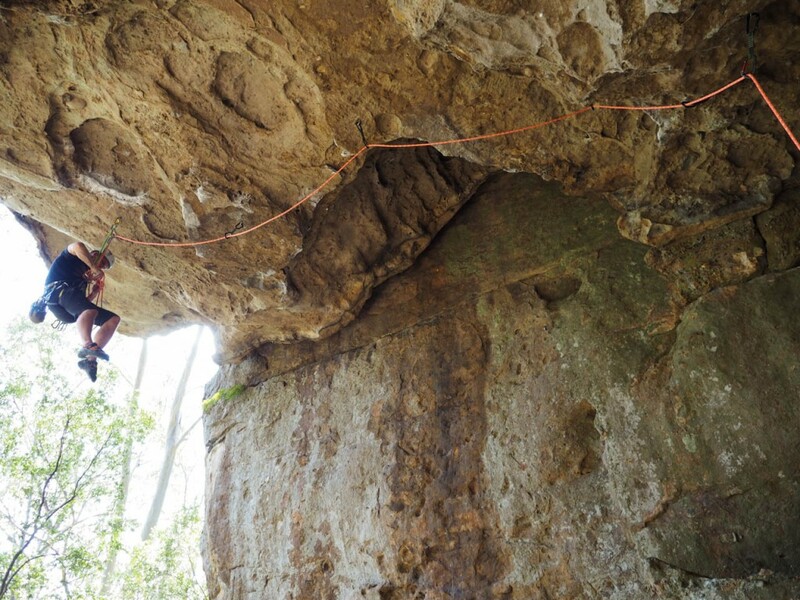 After a few attempts, he found an alternative hold on a sharp edge and managed to extend his arm out, just slapping the quick draw into the ring bolt – a dyno clip, he called it later. After a couple more attempts he managed to get the rope through the draw and was grateful when I took in. Garry was done but he’d made a champion effort just getting to that point. The move over the lip looked hard as nails. Lowering off the route proved to be almost as much effort as climbing it in the first place. He struggled back across the roof to retrieve the draws, taking his weight off the rope and anchors for just long enough to unclip. ‘Grade 20 my arse,’ he swore after he had touched back on solid ground. His left hand was shredded. Sitting down again, I consulted the guide book. In the end, Garry had gotten about half-way through Rabbit Trap – a two-star, pumpy and strenuous grade 25 route across the roof – and not the more moderate Bubba The Love Sponge, which actually traverses the wall beneath the roof. I burst out laughing. Garry was indeed shot though he had made a pretty impressive effort on a pretty impressive route, albeit the wrong one. And it was just about worth it too.